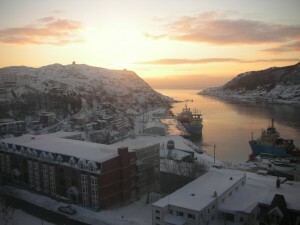 I have had another great trip to Memorial University, Newfoundland involved in teaching and education research. Phase 1 of the new MD curriculum was coming to an end while I was there so I participated in several evaluation meetings and student presentations. The concepts and practices of medical education in Phase 1 came under constructive scrutiny. The experiences of early student engagement in communities across Newfoundland and Labrador have been very positive for learning about all seven of the CanMEDS roles in authentic contexts. The integrated learning sessions every two to three weeks have had a problem- or case-based focus. The student-led discussions have been effective for examining all the determinants of health in mature dialogues between the students. Phase 2 started dynamically with active learning about normal ageing including issues about the determinants of health and about social accountability. Naturally there have been some problems with the new MD curriculum but at Memorial there is an openness and honesty about discussing the strengths and weaknesses of the new curriculum. It is much more comfortable to be working in this culture and society than in more censorious, repressive environments. There was also a Medical Education Scholarship Centre journal club meeting where I presented a paper on social accountability by Woollard and Boelen (Medical Education 2012: 46: 21–27). We identified the challenges involved in engaging faculty and students in the communities we serve in our CanMEDS roles. The other main focus of my time was planning my contributions to the Canadian Conference on Medical Education (CCME) which will be held in Ottawa next month. I have been liaising with Faculty of Medicine colleagues in the offices of admissions, undergraduate medical education, and postgraduate/continuing professional development in particular. My medical education practices will be on show. This entry was posted in News by Iain Robbe. Bookmark the permalink.